...... even Internet Explorer favorites. And all that is done just in a couple of clicks! Because Outlook Backup does what it has to. And it does it better than any other backup tool. Wizard-style interface of Outlook Backup was designed so that even a beginner will master the program. Both backup and restore operations are performed in ABF's famous 3 steps manner: What - Where - Go! And that's all! Outlook Backup enables you to backup directly to an external hard drive, flash drive, removable device or any other remote storage. You can even burn your backup file to CD or DVD using the program's internal CD/DVD burner. 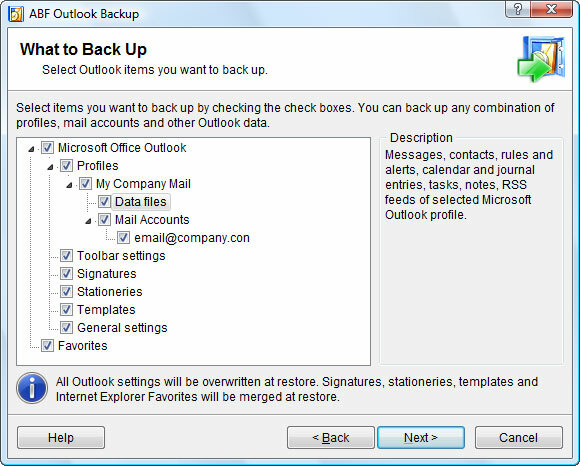 Using Outlook Backup you can protect Outlook backup file with a password, encrypting backups with industry-standard AES 256 algorithms to prevent unauthorized access to your private or corporate data. A backup, restore, and synchronization tool for the MS Outlook 2000/XP/2003. A backup and restore tool for the Microsoft Outlook. Qweas is providing links to ABF Outlook Backup 3.21 as a courtesy, and makes no representations regarding ABF Outlook Backup or any other applications or any information related thereto. Any questions, complaints or claims regarding this application ABF Outlook Backup 3.21 must be directed to the appropriate software vendor. You may click the publisher link of ABF Outlook Backup on the top of this page to get more details about the vendor.